On February 12th I had the opportunity to photograph one of the legends of comedy, Robin Williams. He was performing for a sold out crowd at the Rimac Arena on the University of California, San Diego college campus on his “WEAPONS OF SELF-DESTRUCTION” tour. It was one of the more difficult shoots that I have ever done. This was due to the restrictions placed on the shoot by the Robin Williams people. I was allowed to shoot for 2 to 3 minutes at the start of the show from the soundboard, which wasn’t new, it was the low lighting and the frantic movement of Robin himself that made it tough. Combine that with the late arrivals who walked down the center isle blocking all view of the stage and you get one very frustrated photographer. On the plus side, since they also wanted me to shoot a couple of trade photos after the show I did get to see the entire show from a 10th row seat. They guy really is funny. 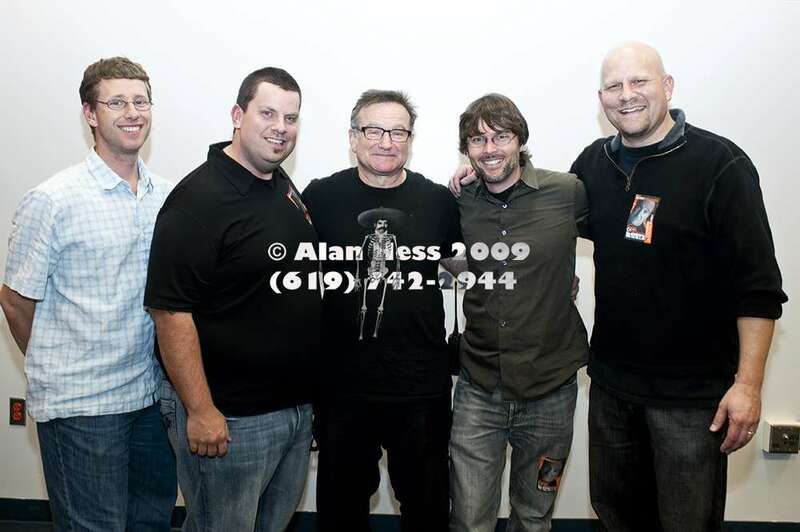 On March 5th, three weeks after I shot Robin, it was announced that he was postponing the rest of his shows. 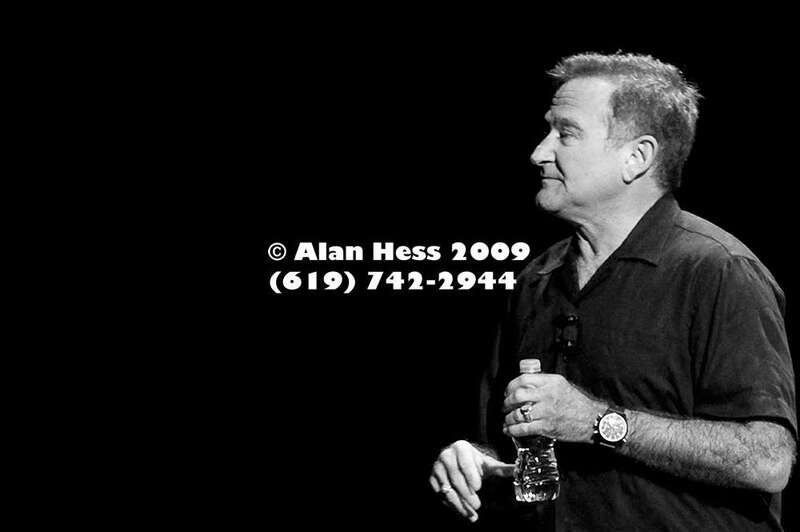 MARCH 5, 2009 NEW YORK, NY – Robin Williams is postponing the remainder of his critically acclaimed one-man show, “Weapons of Self-Destruction,” to undergo surgery for an aortic valve replacement. The tour is expected to resume in the fall. Previously purchased tickets will be honored once the new dates are scheduled or ticketholders can contact their place of purchase for refunds. 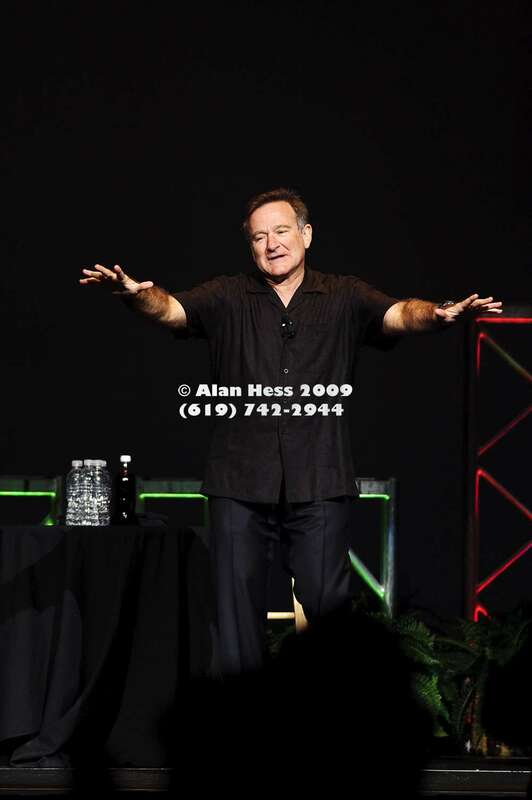 Williams has been on the sold-out 80-city “Weapons of Self-Destruction” comedy tour since September 2008. After the show, there was a meet and greet for the fans who had purchased that package. The Williams people were like a well oiled machine, making sure that all the fans got the opportunity to get a photo and an autograph along with a special t-shirt and other goodies. After this group was done, I had approximately 15 seconds to take two group portraits. I used a 28mm lens at f/4 with a Sb800 on the Nikon D700. The problem was the mix of ambient light sources. There were overhead fluorescent lights and at least two standing lamps with warm incandescent bulbs spilling into the scene. I aimed the Sb800 at a 45degree angle and fired off 4 quick shots, while Robin cracked jokes the whole time. Then it was time for the next group and I repeated the process. I am not terribly happy with the image results but with the tiny sliver of time allowed, it could have been worse. As a side note, if you are getting your photo taken with a famous person, look at the photographer, it will help in getting a better photograph and when you know that there will only be a few seconds to take the photo, don’t wonder off so that we have to track you down.